Having just celebrated its eighth anniversary last month, Oakville’s Moonshine Café is about to get a new feather in its cap to display as part of its many mementos of special moments over those years. 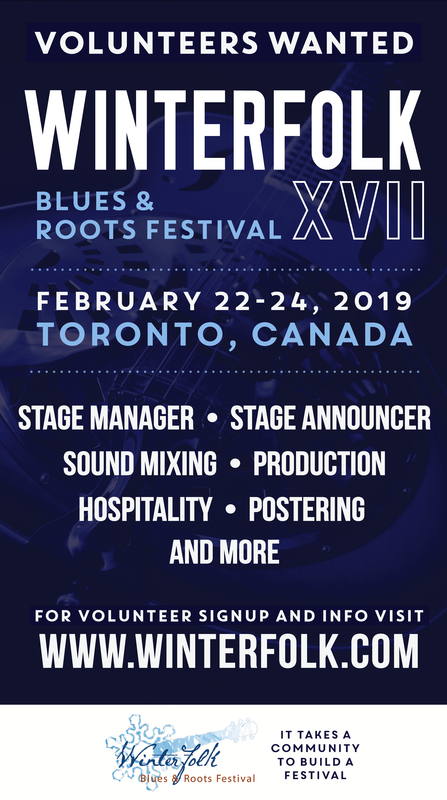 The room at 137 Kerr St. in downtown Oakville is being toasted by organizers of the Winterfolk Blues & Roots Festival for its sterling contributions to the GTA live music scene, of which it has been an avid supporter since opening its unprepossessing doors in 2006. 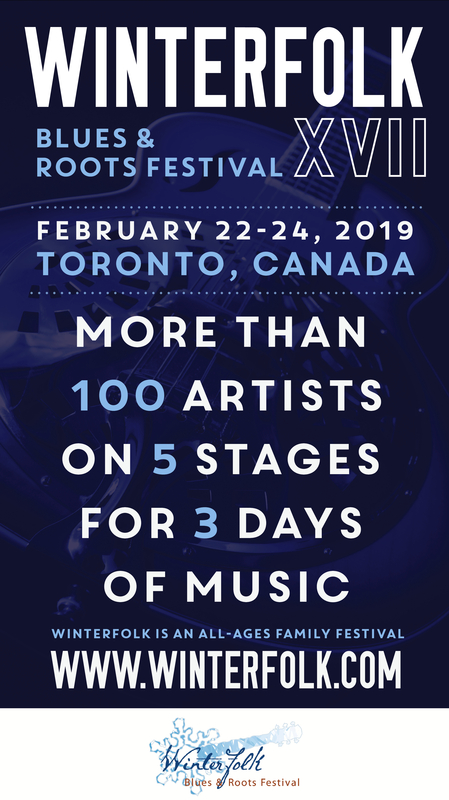 A special award presentation of a Certificate Of Appreciation will be made at 2 p.m. on Sunday, February 16 on the main floor at Black Swan Tavern (154 Danforth Ave.) at the start of the Moonshine’s “best of” showcase presentations that it does annually as part of the community stages offerings of the festival. If you happen to live in or near that part of the GTA, you’d truly appreciate what Moonshine Café’s contribution to the Oakville area has been. Sitting in fancy halls among the “jewellery rattling” set of the uber-affluent burb to listen to world-class music is not an unpleasant way to pass an evening, to be sure. But without the Moonshine you’d be hard pressed to find anywhere in the area to hear the very best of musical talents in a cozy, relaxed and unpretentious bar environment. There are certainly other bars that offer live music in Oakville, but Moonshine brings in artists from the Folk, Jazz, Country, Blues, Rockabilly and Pop Rock persuasions who are truly at the top of the heap, not just a group of guys doing yet another version of Q107 or other old radio fodder. And even better, Moonshine does it seven-days-a-week, with double-shows most Saturdays and Sundays. As I’ve mentioned before, the long list of top-flight performers who’ve appeared there is exhaustive and would be exhausting to recite, but think talents like David Bradstreet, Ray Materick, David Essig and Brent Titcomb from the Folk world; Kevin Breit and his Sisters Euclid group doing Jazz Fusion; top young indie Pop talents like Young Running and Rock legends like Stephen Fearing and Dave Rave; veteran and young Country/Rockabilly talents such as Dan McVeigh, Ginger St. James, Krista Earle and Shawn Brush; Gospel artists like Danny Brooks and Max Woolaver; Blues heavyweights like Alfie Smith, The Weber Brothers, Fathead, Suzie Vinnick and Doc MacLean; and you’ll get just a hint of what’s regularly on offer here. And that doesn’t include the innumerable open stage and specialty showcase nights for young artists, ukulele players and so on, or the comedy improv and poetry night shows. What’s more, cover charges for the smallish, 60-capacity venue are always quite reasonable, often just $5 or $10, sometimes only $2 and seldom as high as $20. Moonshine is not a fancy place by any means. Its “kitchen” consists of a barbeque that sits out front year-round; its selection of draughts is modest, though it’ll please any taste; its furnishings are comfy enough but not sumptuous; artwork on the walls is either works by local artists, funky kitsch pieces or, on most other available surfaces, photos of the artists and customers enjoying the room; its televisions that beam popular sporting events and jukebox that blasts out mindless music are —non-existent! So it’s not the extra attractions or special amenities that are filling the place –it’s the music and the vibe. That’s all down to the passion, taste and focus that owners John Marlatt and Jane MacKay have brought to what they do since day one. John is a musician of no small accomplishments himself and has parlayed that into a more than competent aptitude for doing the sound —so much so that the club is now starting to record some performances for future releases, including even some “live album” shows. 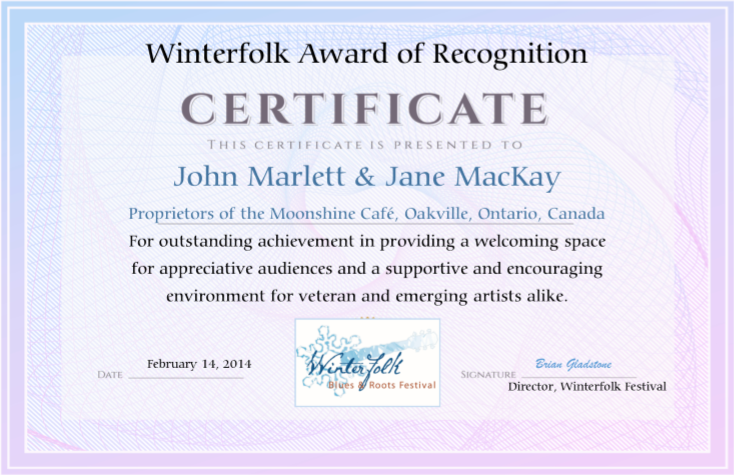 While such recordings will no doubt add to the legendary status of the room it’s the memories of eight years and counting —and anticipation of many more— that is why Winterfolk’s Certificate of Appreciation will soon join the many other testaments to its vital role in fostering live music already on its walls.